Yes, PETA has an agenda. Yes, the 9 minute video below probably represents the "best" of the worst the PETA investigation had on tape. However, it is difficult to spin what is on the video just because of the PETA agenda. Those with agendas, whether it is an animal's rights group or 60 Minutes, may be driven to find nasty stuff and paint the nastiest picture possible, whether they are investigating horse racing or the auto industry, but generally where there is smoke, there is fire. And exposing the fire, can affect change. I don't think anyone in the industry who attacks the messenger (PETA) is doing themselves or the industry any good. Apologists are a big part of the reason the industry is struggling so much these days, and why a drug culture is pervasive in the backstretch. The only thing I learnt new on the video was that buzzers are probably more widespread than I imagined. I remember Shane Sellers admitting to using buzzers (in a biography I think), and he was quickly admonished by industry insiders as a bad person with plenty of demons who shouldn't be taken seriously. It is hard to watch Gary Stevens and D. Wayne Lucas joke about their knowledge of buzzers and not believe that this a something widespread. Really, the only things that are illegal on the video is the bit about buzzers, and the forging of illegal immigrant's documents. The other gray area issue is the idea of tricking the vet to get a sore horse passed to race. I realize that some horses are sore one day and OK the next, and sometimes are sore in the morning but get out of it by race time, but if the intention is to put one over on the vet so that a known sore horse has a chance to be claimed, well that is dangerous for the jockeys and even horses in the race, as well as a complete screwing of the betting public. As for the treatment of horse's in the video. Unfortunately, as stated earlier, the drug culture is accepted in the backstretch, and I don't see anything illegal being done. It is though an admission that drugs, not needed to treat the conditions the drugs were meant to treat, are used regularly as performance enhancers. Although masking wasn't touched upon, all you have to do is look at how many times Super Trainers have got slaps on the wrist to know that between trainers and vets they are playing Jr. chemists. It isn't a surprise that horses get a regimen of drugs that wouldn't be prescribed by a vet if they were not racing. Especially when it comes to trainers that have multiple outfits throughout the US and Canada. I've heard of situations where the program trainer (usually a high percentage trainer) doesn't actually show up in person at certain tracks for months at a time. As a Horseplayer, I look at it like this: There are only so many ways to train a horse so one trainer shouldn't be that much greater than the next unless they are really in tune with their horses on a day to day basis....or they have some really decent concoctions and a regimen that just about anyone can follow. Does a high percentage trainer have the ability to find phenomenal prospects (assistant trainers and grooms) at just about every track they have an outfit? I'm not that much of a dummy to believe that assistant trainers should have that much of an edge over trainers who have just one operation at one track. But I factor this into my handicapping. I wish I didn't have to deal with it. I have very little confidence when betting on a race with a Super Trainer in it, as I'm usually playing a perceived overlay, that really isn't an overlay. Shock therapy on horses is permissible as long as it done a certain time before a race. Tapping a horse is a necessary evil to get a horse back into a race. I knew this already. But watching the video brings me back to thinking, why doesn't the betting public know when a horse was last tapped, or when shock therapy or when a horse last visited a hyperbaric oxygen chamber? From a Horseplayer's viewpoint, why should a trainer, the vet, and/or some backstretch help be privy to this information, especially if they have the ability to wager? I also wonder why horses today have so many less starts, both per year and per career, than they did a few decades ago? I have to think it can only be two things (and likely a combination): A weaker breed due to owners wanting and getting quicker returns, and use of drugs (which could both drain horses and also be partly responsible for a weaker breed). I realize getting rid of the accepted drug culture cannot happen overnight, nor will we see horses only running on hay and oats any time soon, but in the meantime, measures have to be done. Reducing allowable drugs to a number less than 10 is a must (see Alternative Ways To Train A Race Horse). This includes banning many supplements. What is the difference of giving a horse EPO or DPO or finding a natural supplement that will have the same affect? Apparently, they are out there and are easily attainable. Second, there has to be heavy fines, even potential jail sentences when it comes to using drugs or supplements that are not on the accepted list. No more slaps on the wrists. Finally, Horseplayers deserve to know of any major procedures (including tapping, operations, and even hyperbaric oxygen chamber visits). This should be reported right away by the trainer and then put into the past performances when applicable. It isn't a bad idea to put the vet on the PPs as well next to the trainer's name. I'm not sure if cleaning up the backstretch mentality will lead to new Horseplayers. It will instill more confidence in existing ones though, but no matter how much is done, the average Horseplayer loses too much too fast due to sky high track takeout, and that also needs to be addressed if horse racing is to actually grow. Maybe the fact that a clean up by itself probably won't grow the game is the reason why nothing seems to change when it comes the drug culture and transparency for Horseplayers. The PETA video though creates the possibility of instilling less confidence in current Horseplayers and it also could be used as fuel to reduce or even take away alternative gaming subsidies as well. The latter may scare Horsemen groups and racetracks to go faster than a snail this time around when it comes to drug reform, and stop making excuses and stop shooting the messenger. HorsePlayerNow has a quick survey on the PETA study and Horseplayers, check it out. Andy Beyer recently wrote an article: Racing industry keeps horseplayers off balance. It is a relevant article, in that it illustrates how Horseplayers are challenged with handicapping different distances and the fact that run up times (the time from when the gate opens to the actual starting time of the tele-timer differs from distance to distance and track to track). Yes, these kind of things are hard to explain to newbies, but the reality is that I doubt they affect whether a newbie ends up being a Horseplayer or not. These are issues that are specific to those already playing. And even if they were resolved, for example, if thoroughbred tracks got together and made it a rule that the only distances allowed for tracks were 4 1/2f, 5f, 5 1/2f, 6f, 6 1/2f, 7f (I wish they'd get rid of this distance), 1M, 1M1/16th, 1M1/8th, 1M 3/16th, 1M1/4, 1 1/2, and 1M3/4, and they also specified that run up distance can only be 20 feet, players would still be losing 21% of their money on average each race. One could argue that having full knowledge of run ups and the intricacies of each specific distance is one way to find an edge in a game that pits good to great handicappers versus good to great handicappers. The dummy money is long gone and pretty much everyone who plays these days uses track variant adjusted speed figures, so there aren't many ways left to find edges to overcome the insidious track takeout. The big problem racing faces is that no matter how badly they want newbies, there is next to no reason for a newbie to be attracted to horse racing. Horse racing is about gambling, it is competing directly with slots, lotteries, poker, sports betting and even fantasy sports betting nowadays. Other than and lotteries and slots (which is mindless gambling with no learning curve), horse racing's gambling competition is perceived to be beatable (and most are beatable long term by at least a few). So if a gambler is going to learn a new game, there is at least a possible attainable achievement in learning poker or sports betting. Why learn a game that has no visible winners with a huge learning curve attached to it? 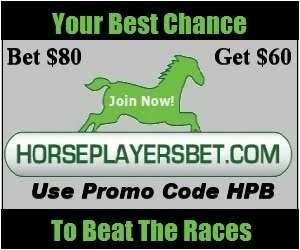 Perhaps, a series like Horseplayers will give newbies some false hope the game is possibly beatable by at least someone who doesn't receive rebates. Maybe, maybe not. In today's day and age, many people investigate ideas on the internet before making a move. I don't think very many doing due diligence on betting horses will become Horseplayers very fast. Since the overwhelming majority of gamblers inevitably lose, regardless of the game they are playing, another main factor comes into play: Bang For Your Buck. Horse racing fails miserably here too. Gamblers brains go in all sorts of directions when they are gambling, but if their money disappears too quickly, the fix they get from gambling diminishes. A gambler could get as much of a fix betting $20 on a football game that lasts 3 hours as they do in wagering $20 on a horse race that lasts a minute or so. Even though the reward could be a lot higher on the horse race, the fact that the sports bet has a takeout of 4.6% versus an average takeout of 21% on horse racing, the sports bettor is likely to have their bankroll last a lot longer. The sports gambler is more likely to handicap and watch sports the next day over playing the races. Lotteries are often cited by know-nothing-it-alls in the comments section of some racing articles that discuss product pricing. Yes, lotteries have a larger takeout than horse racing, but when one buys a lottery ticket most of the time, they are buying the dream of winning, of quitting their job and buying a house in Aruba. That is a big part of the fix, plus there is no learning curve. Horse racing's answer are these Jackpot Pick 6's which really just drain the bankrolls of current players faster, taking away much needed churn (Bang for your buck), and as for the pros and cons of the gambler's fix, I believe they do more damage than good. Yes, horse racing has all sorts of problems, from drugs to run up times to its high learning curve, but the biggest problem is that it is no longer attractive to new potential players, and it all points to the price of the product. If the game was perceived as beatable by at least a few, then the new demand created would force the industry to fix their micro-problems. The industry has done just about everything but faced the fact that they are all about gambling and need to address their pricing problem, but as Pull The Pocket points out (Why Do I Need 4 Betting Accounts), the result is a mad dash to get a higher percentage from a shrinking pie at the expense of the Horseplayer, which causes the pie to shrink even more. Handle has gone down so much in the past few years, that when it doesn't go down one month, it is perceived as a victory by industry leaders. Horse racing is a great game. A thinking person's game. But the industry seems to close their eyes and kick its heels repeating "horse racing is entertainment not gambling, horse racing is entertainment not gambling, horse racing is entertainment not gambling." No matter how many times they open their eyes, they are never in Kansas.